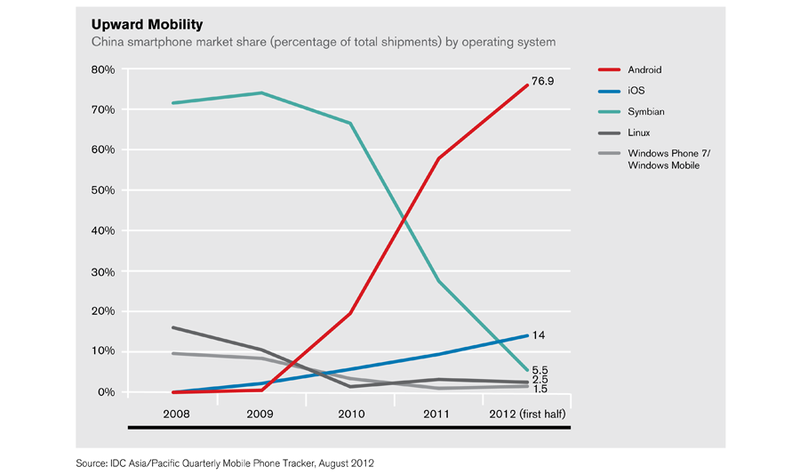 Google’s mobile operating system is particularly dominant in China’s rapidly growing smartphone market. Google’s Android has gained a sizable advantage over Apple’s iOS in the fight for worldwide smartphone operating system market share, thanks in no small part to its dominance of China’s market, which is expected to surpass the United States this year as the world’s largest for smartphones. The first chart above shows that while Apple has been steadily gaining Chinese market share over the past four years, Android’s market share has skyrocketed from under 20 percent in 2010 to over 75 percent in the first half of this year. The second chart shows how rapidly the market has grown since 2008. 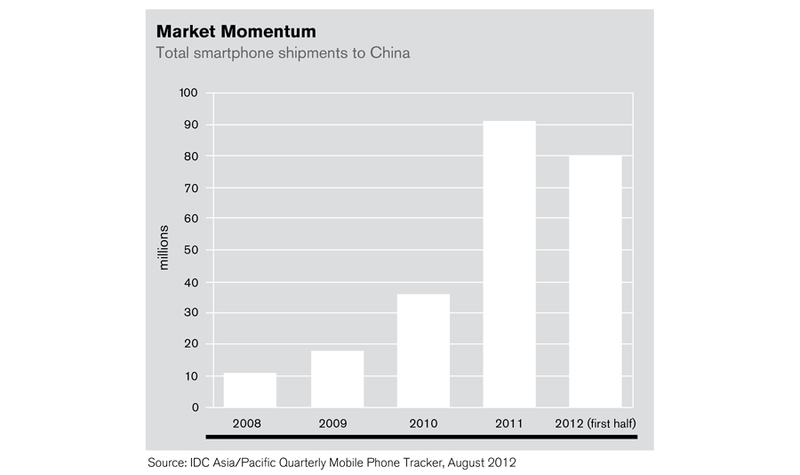 That year, 11 million total smartphones were shipped to China. Eighty million were shipped just in the first half of this year. Android has been bolstered by Samsung, which IDC reports shipped more total phones in this year’s second quarter than the next seven Android vendors combined. Samsung has had particular success in fast-growing markets like China by offering a range of models that are much less expensive than the iPhone (see “With Smartphone Sales, Samsung is Already Pulling Ahead of Apple”). IDC expects China to account for 26.5 percent of all smartphone shipments this year, compared to 17.8 percent for the U.S. The third largest market is the United Kingdom, at 5.3 percent.